Right.... the Gn15 bug has bitten, and being stupid, I'm going to build something, not from a proprietry chassis, but from scratch. 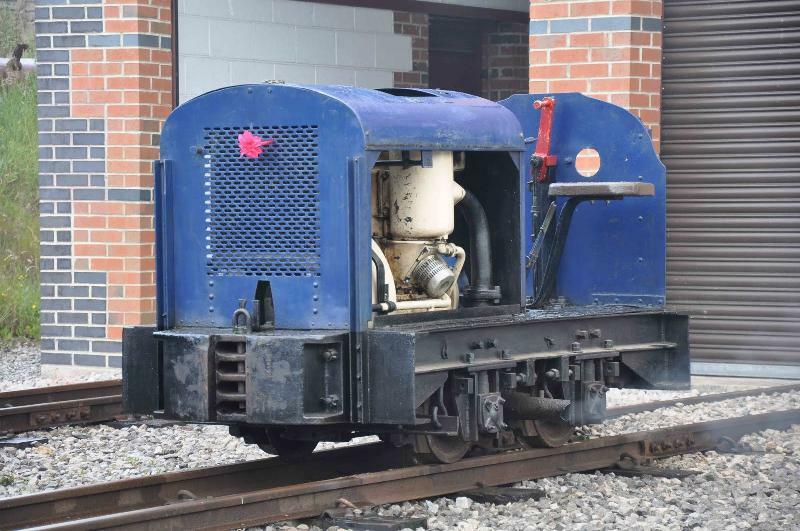 Whilst doing a Googly Image* search for 'Narrow Gauge Loco', amongst other things, I found this. There's just something about it that took my fancy. Does anybody recognise it? A few weeks ago I bought the wrong size wagon wheels (the flanges rub on the chassis), they're 14·1mm, so I thought I'd use them on this. Today I went to the Calne show, and bought a bag of gears and worms, so here's what I have so far. 3) Wrap a shim out of 10 thou. sheet. So, who's going to be the first to tell me that I've, a) bitten off more than I can chew, or b) tried to run before I can walk? *other search engines are available. Last edited by MrPlantpot on Tue Feb 28, 2012 10:00 am, edited 1 time in total. Think I have some but am just procrastinating from some homework at the moment. Really like the look of that critter. If you go for option '2' I would suggest starting with tube rather than rod (unless you have access to a comprehensive workshop). I have tried option '3' in the past and never managed to get the gear to run true......but that might just be me. Another alternative could be to use a lay shaft, with 2 worms on it, driving the axles directly, and then driving that shaft with a pulley on the shaft and an 'O' ring looped over the motor shaft. Hope that this has helped rather than hindered. ps Yes, you probably bitten off more than you can chew but the only way to find your limits is to try and go beyond them. Good luck and enjoy the voyage. Ian, I had thought about starting with tube, but all I could find locally was Imperial sizes... didn't think about Eileen's, just assumed Metric wasn't readily available... will look on their website if all else fails. 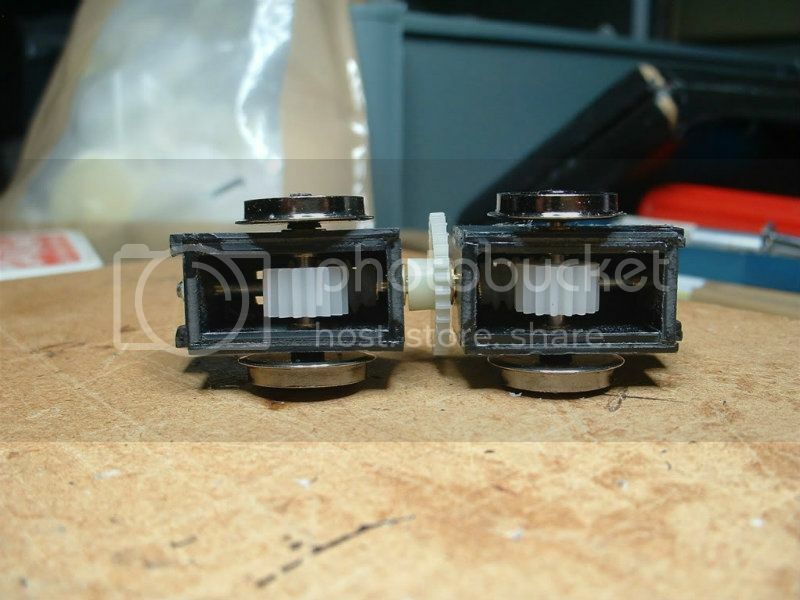 Adrian, I have 2 motors; the other is complete with tiny gearbox an has a 3 mm output.. is also about twice as long. This motor is ideal, cuz I should be able to hide it in an engine casing. I had thought about a layshaft, and it is still an option, but I'd like to try it with just 2 wheel drive to start with, maybe just as a mocked up frame. The 'O' ring drive is a good idea... I think I'd make some pulleys rather than have it running directly on the shafts though. bbudduk, thankyou for that link... some useful pictures of the 'other' side (if a little blurry), but it means I can search for pictures of others of the same type. I may even make the 150 mile jouyney to see it in the flesh (one day). I'm not intending a 'scale replica', just a representation... I have no dimensions, so it'll all be done by guesstimation, and see what fits. A solution I have used several times involves a length of insulation from electrical wire. You will need to try different size wires, and it can be fiddly to fit (try inserting a long length of insulation into the worm and then the motor shaft, and then trim off any excess). I would personally go for two stage gearing though. Both are simple designs and are achievable, but whatever you try, go for it. Last edited by Geeky Gecko on Sat Apr 14, 2012 5:44 pm, edited 1 time in total. Thanks for those pics Stefan. I gnew I'd seen them somewhere, but couldn't remember which thread. I see that you have got the same motor, and same gearing on the 'black' one, but your wheels are smaller. I'd like to know how well and how slowly it runs please. Also, where did you get the 2mm top hat bearings? Steve, using a Gaugemaster Combi controller it will run smoothly at 1 metre in 24 seconds. With 14mm wheels that would be about 21 seconds. For top hat bearings you could try www.intercitymodels.com or www.mainlytrains.com (no connection). Something else to think about is weight, cramming as much as possible into the model is essential for good electrical pick up. My chassis weighs in at 40gms but the weighted body it was designed for takes it up to almost double that. I appear to have made a daffodil !! As I said earlier, I opted for Nº2. I did a trial run with a spare worm, and it worked. So, here's how I did it. I accurately chamfered the end of some 2mm Plastruct rod, (by twiddling it in my fingers and dragging it across a sanding block) cut off a length slightly longer than the thickness of the gear, and pushed it in 'til it was just shy of the other side. I then twisted a 2mm drill in the 'recess' to centre the end of the rod, then pushed it through. I then ran a 1mm drill through in a pin chuck, and by eye, it looked central. Next came the 1·4mm, and finally the 1·5mm. (the 1·4mm was a. just in case I need to 'pull' the hole, and b. it also makes the final hole more accurate by releasing any internal stresses[I think]). Then I trimmed the ends fush with the gear, and pressed it onto the motor, but not so far as the serrations. Ran the motor and all was fine. No wobbles, no nasty vibrations. So.... the daffodil... The 10T, and the 42T on the worm shaft will be 'hidden' inside the radiator... so I made a fan! There were 30 teeth on the 'non-used' gear, so, 12 saw cuts and a bit of filing later... one fan. Back on the motor... smooth all the way up to 13·6 volts (not that it'll see that much on track). Right, it's bed time..... see what I can do tomorrow. Ran the motor and all was fine. No wobbles, no nasty vibrations. Well done and I hope that the rest of the build is as successful. Where has that 2 weeks gone?, I seem to have done very little. 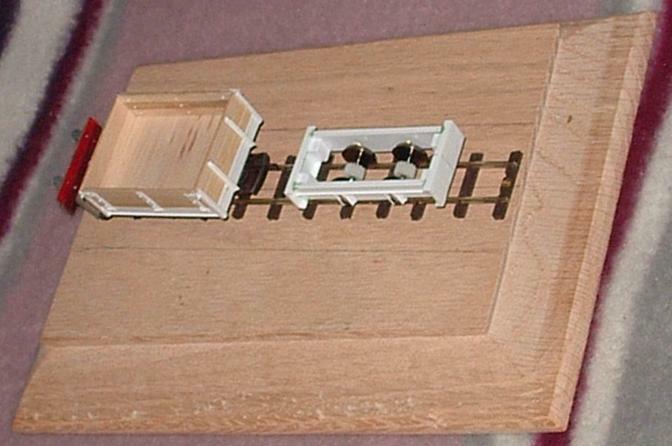 The first problem I had, was that none of the local model shops wanted to sell me any ½" styrene channel. I looked on the Evergreen website... they don't make it! (which goes some of the way to explaining the lack thereof in the shops) I looked on the Plastruct website... they do it... but only in the old grey (slippery, and need to use their own cement) type. However, I did find some ½" I beam... so I cut me a length just over twice the width of the critter, and cut the flanges off one side, rubbed it about a bit on some emery, then out with the razor saw and mitre box... hey presto! 2 buffer beams. I have also been doing what seems like vast quantities of mathematics, trying to work out how deep the side frames needed to be, as I wanted them to be one peice full depth, for strength. After what Stefan said about needing all the weight I could get in, I toyed with the idea of making them from 18swg steel plate (my Dad bought a box of 2½" x 3½" plates at an autojumble many years ago) but I find I have neither the skill, nor the equipment to cut it without it bending.... could have had real rust weathering. I have also wrapped a length of 0.8mm brass wire around a spare 2mm axle to cut into 4 for the springs. The Deutz has rolled plate 'secateur' springs, but as this is MY loco, I'm having ordinary coils... so there! Next... I still have to decide what shape the bottom of the sideframes will have... if I cut it to look like the Deutz, the styrene will be weak. I'm not sure whether I want them parallel with the rails/footplate, or sloping down from the buffer beams to the axle boxes. ... really nice detail shots .. any idea what kind the green loco in the background is? A simplex? mad gerald wrote: .. any idea what kind the green loco in the background is? A simplex? I'm sure I've said earlier that I'm not proposing a scale replica, just my interpretation... but thankyou, yes, these will be a great help... at least now I can see what goes where. I had no idea that the box on the firewall was the sandbox, or where the throttle was... but I'm still wondering about the three levers on the gearbox.... Forward/Reverse, Ratio change.... and a third one.... I could accidently omit that one... no-one will notice. the back must be the brake. Right, Steph? Love that seat! The 'third" lever/pipe appears to be the starting handle that is 'resting' in the cab area. More_Cats_Than_Sense wrote: The 'third" lever/pipe appears to be the starting handle that is 'resting' in the cab area. Golly, another 2 weeks has rushed by..... but then, I have just done a bit of work on my 22 year old Volvo estate to get it through an MOT. (not to mention rebuilding a petrol engined strimmer from eBay). 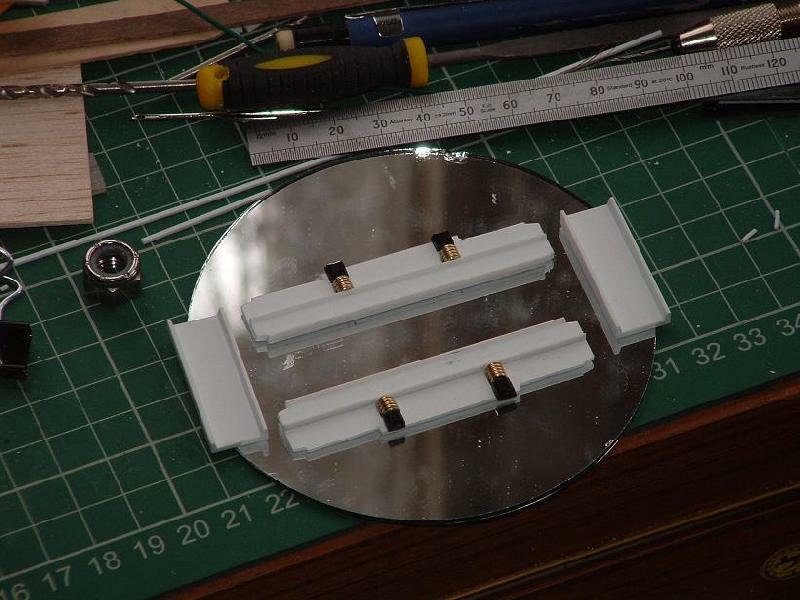 As you can see, I have a small mirror that I'm building on.... hopefully, it will make sure that everything is flat/square/perpendicular/etc. Making the springs was really good fun 4mm diameter by 4mm long! From the coiled length, I cut 4 sections of 5 or 6 coils each, then threaded them back on the 2mm axle, and held the end against a grinding wheel in my mini drill.... first to flatten, then to smooth.... then repeat for the other end.... and the other three springs. 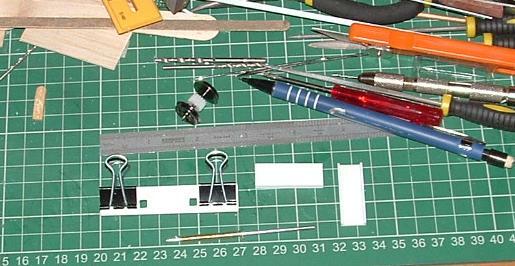 Axle boxes are 4mm, self adhesive 'jewels' from the craft section of a shop we have here called The Range. I did find similar ones on eBay, but I didn't need 500 of them (I still have 96 for future use). I rubbed the adhesive off the back with my thumb, then rubbed the 'chrome' off on a sanding sponge and stuck them onto some black 1mm styrene (which is why they look black... they're actually clear. And in case you are wondering why there is an M8 nut there (which you probably weren't), I have found they are a very cheap alternative 'back to back' gauge ie. using the corners, not the 13mm across the flats dimension. Until next time.... be good! 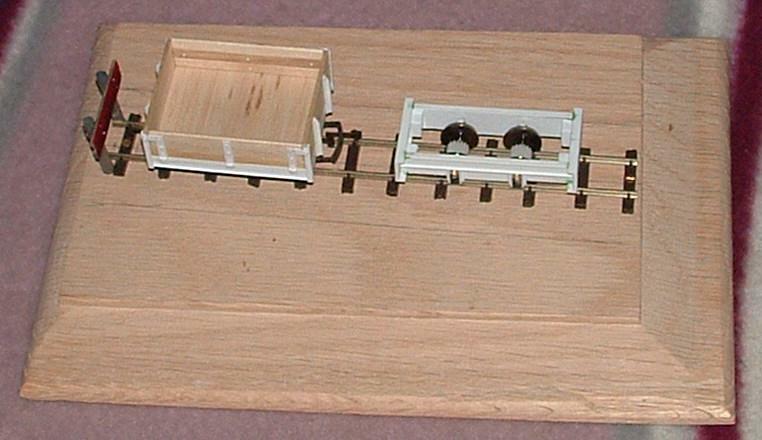 Coming along nicely, noting that you purchased the axle boxes from a craft shop there are also springs of 4mm diam available, used by SWMBO's to make jewelery. They are around 6mm long with loops at either end, can't be exact as the only one I can find one loop was cut off to make the front door knocker on Gem-u-Nine. Not that there's anything wrong with your springs. MrPlantpot wrote: And in case you are wondering why there is an M8 nut there (which you probably weren't), I have found they are a very cheap alternative 'back to back' gauge ie. using the corners, not the 13mm across the flats dimension. I have made a little more progress (not much), but I have a rolling chassis. If I get around to it.... photo later. Right... what have I done? In the previous pic. everything was just laid out (only the channel sections were glued). So, the first thing I did was to cut 4 lengths of 2mm styrene rod for inside the springs, so that they'd be easier to glue in. 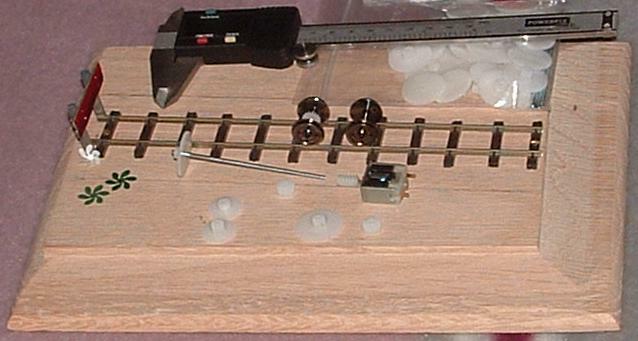 The sides were held down onto the mirror, outside face down, and the springs pushed in till they touched the mirror (x4), and a drip of liquid poly applied to the ends... I then left them for about an hour, before turning them over and adding the axle boxes. Next, I cut 16 lengths of 15 x 60 thou styrene strip, slightly too long, for the axle box guides. I stuck them flat on the sides first, then the edge-on bits next. 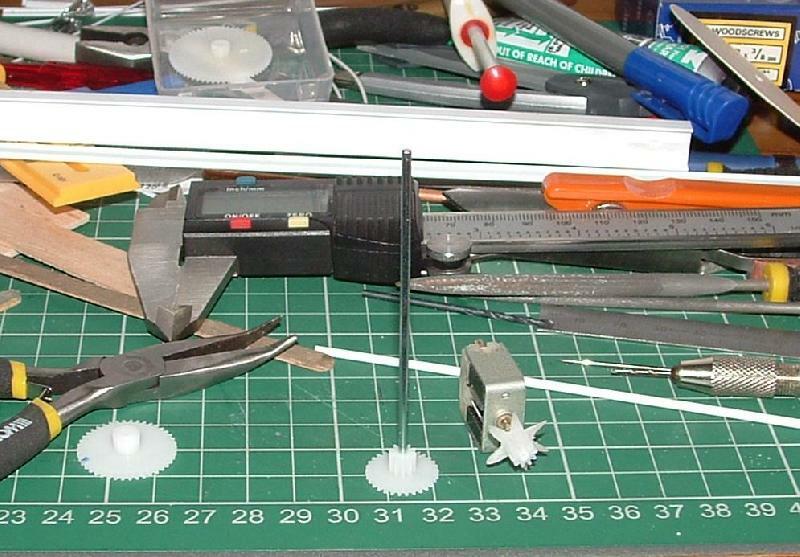 Then 4 bits of 1mm square were put under the axle boxes, and after I was sure it had all set, everything was trimmed. I drilled the axle holes 2mm dia. x 2mm deep, and pressed in the top hat bearings. I cut 4 short lengths of ¼" square, and glued them flush with the ends, on the inside. 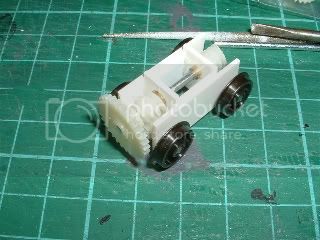 With a rectangle of 1mm styrene on the mirror, the sides and ends were placed around, and an elastic band holding it all, the axles were put in, a little bit of jiggling, and I 'flooded' the joints with liquid poly. A small amount of glue got onto the rectangle, but it popped out easily.... the frame seems square, and strong; the axles run freely, and it rolls well on a gentle slope. 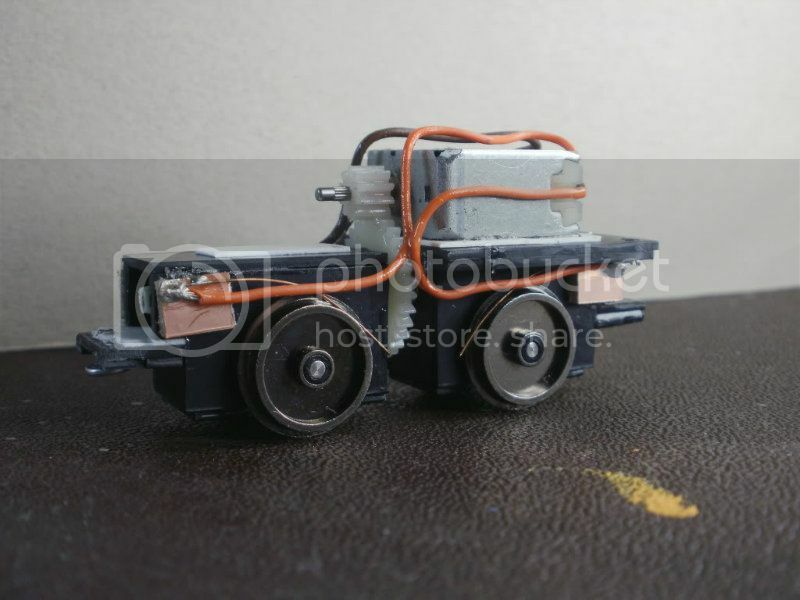 It is seen here with one of my 1/32 scale wagons, and it looks tiny.... I've gone up a scale, but down a size!.... I really must put some scenery on that board. For a sense of scale, the track is 9" long. Are tryping errons some sort of Welsh dish made with leftovers? Artizen wrote: Are tryping errons some sort of Welsh dish made with leftovers? Most probably, but don't ask me how to cook it. On the subject of scenery.... I have bought a hanging basket liner.... is there a 'How To' thread that someone can point me to, please? Progress on the critter will be slow until I get some bearings for the worm shaft. I've put a bid in for some on eBay.... but I've been gazumped on two previous listings. I bet there was some for sale at Shepton, I should have looked harder.